At this final cloning stage, the target PCR product is inserted upstream (N-terminal) of the muFc, now present in the pEE12 expression vector. The final product will serve as the template for protein expression in NS0 cells. 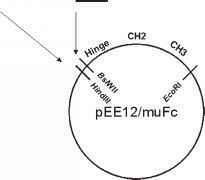 Ligation of the target PCR product into pEE12/muFc is depicted in Fig. 4. Fig. 4. 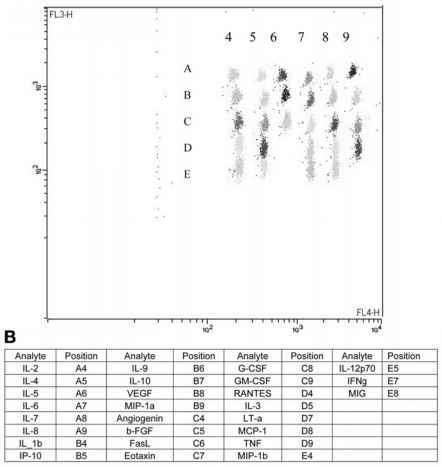 The target PCR product is cloned upstream (N-terminal) of the muFc in the pEE12/muFc master vector, using the restriction enzyme sites Hindlll and BsiWI. 1. Set up the first of two sequential restriction enzyme digests as follows. Incubate overnight at 37°C. Use the target PCR product obtained in Subheading 3.1.2., step 6. 2. Purify digested DNA using Microcon Centrifugal Filter Devices. 4. Purify double-digested DNA using Microcon Centrifugal Filter Devices. 1. Ligate double-digested pEE12/muFc and target, following Subheading 3.2.1., steps 4-5. 2. Use the resulting ligation tubes to transform XL-1 E. coli, screen for positive colonies, and verify vector sequence following Subheading 3.2.2., steps 1-15. Be sure to verify both target and muFc sequences. 3. Amplify bacteria harboring verified vector and purify using Qiagen Plasmid Maxi Kit. The resulting vector DNA will be used to transfect NS0 cells, and will be referred to subsequently as the "transfection vector."